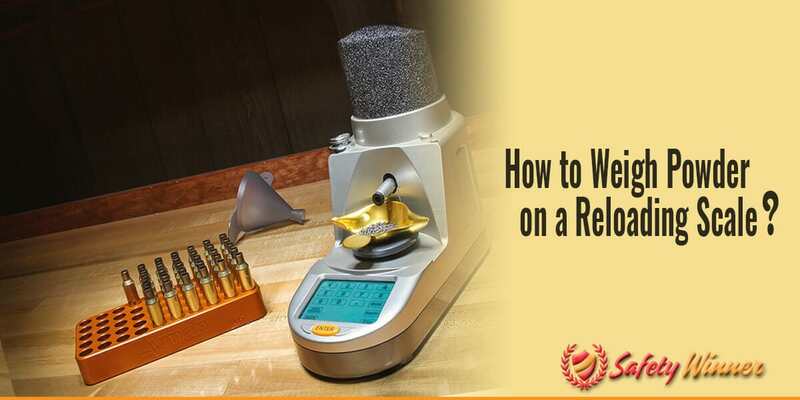 #1 How to Weigh Powder on a Reloading Scale? If you are a person who likes to do things for yourself and you like to hunt or shoot targets, you likely create your own ammunition. The truth is that you can get much more accurate rounds by creating them yourself. It’s why so many people choose to do it yourself option. To be able to accomplish this, it’s a good thing to have your own scale to be able to measure the amount of charging powder and gunpowder you need. Both of these are extremely important in preparing your cartridges, and this is why you need a quality scale, whether you decide to use a digital or mechanical. If you are unsure of exactly how to weigh your powder on the scales, here are some simple instructions for you to follow to fit the kind of scale you have. Many people like using the digital scale because it is so much easier to use and you can get extremely accurate results by using this kind of scale. Most will even shake their head at the idea that they don’t understand how to use a digital scale. It seems to simple. It is a little more complicated though, especially when you are trying to measure grains accurately each and every time. First, we must establish that there are different kinds of digital scales. Some offer you a hopper, where you can pour all of your powder into the hopper. You then set the amount you want to be poured into your scale and electronically this is done. You then check the scale to make sure that it is providing the accurate amount you need and you’re good to go. Before we get too much into that, it is important to explain the need to calibrate your scale each and every time. Included with whatever digital scale you purchased, you should have received at least one calibration weight, if not more. This weight is used to make sure that the measurement you are receiving is accurate. Once you have checked this, you will need to scoop a small amount of the charging powder onto the scale pan until you reach the amount you need. Make sure that you are careful when pouring the powder so that you do not spill. Also, be careful that you slowly add the grains, as you are likely to find that it will not take a large amount to get what you need. What you will find is the more that you use to scale the quicker you will become at knowing how many grains you need to add. You will find that the scale will become more of a proof that you have added the correct amount. The use of a mechanical scale is a little more sophisticated in terms of the work you have to do, but can be a lot more accurate in many people’s opinion. This is because zeroing out the mechanical scale is controlled much more by you personally. It can be a little more difficult to zero out a digital scale, because you are depending upon the scale’s computerized system to set the zero mark. Besides zeroing the scale, you should also calibrate to ensure you’re getting accurate measurements. The manufacturer should’ve provided you with the calibration weight to check to ensure that the measurement you are receiving is identical to that of the weight itself. After you have zeroed and calibrated it properly, your next step is to weigh out your powder. The best way to do this is to set the bar for the number of grains that you are looking for. This can either be determined by weight or by specific grain accounting. Slowly begin to add grains and tell you have reached the amount needed so that the scale is balanced at the zero mark. This will let you know that you have successfully added what was needed. You are also likely to find that with experience you are quickly able to determine exactly how many grains you need without really looking at the scale at all. It only becomes a rubberstamp approving that you have added the correct amount. Remember that no matter what kind of scale you are using, take your time and be careful about how you are handling the equipment. Be slow and methodical at first, ensuring that you are getting the amount of powder that you need and that you have properly zeroed and calibrated the scale with each use. This will help to ensure that during the measurement process that you are getting the exact amount of charging powder that you need so that you get accurate results each and every time. This will make sure that your success in using your weapon will be optimized. It may even be to your advantage to create a procedure of exactly what you will do each and every time that you weigh your powder so that you get the same kind of results every time.